By car, via Sweden, to South Norway for a tour of stave churches (stavkirker). 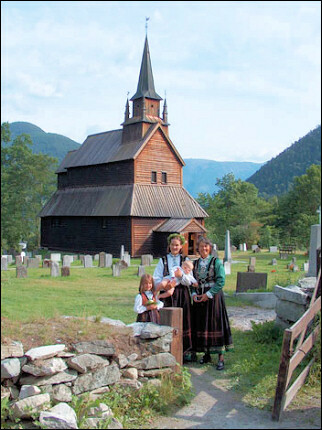 Between 1100 and 1300 a thousand of these typical wooden churches were built in Norway. 28 remain, of which nine are visited during a trip through rugged landscapes from Hamar to Strynefjell, Geirangerfjord and Trollstigvei. Via Ålesund and the green islands of Giske, Godøya and Valderøya along the Jostedalsbreen glacier to Bergen and over the Hardangervidda to Oslo, where the Norsk Folkemuseum has a stave church in its collection. In two days we drive from Holland to Stockholm, Sweden. We spend the night on a camping ground which has seen better times, on a lake in Jägersbo. The greasy french-fries stall doesn't help to get in the "Sweden mood". From Jägersbo it's another 600 km to Stockholm. We take the E4 and pass Ljungby, Jönköping, Linköping and Norrköping. It's not the fast track, but it's a nice route to drive. In Stockholm we drive to the Stockholm Ängby camping site in Bromma; near by is a subway to T-centralen, in the city center of Stockholm. Gamla stan is the old city, with 17th and 18th century buildings. It is a tourist magnet for a reason. Stortorget (the big market square) is the perfect spot for a cup of coffee. We arrive just in time at Kungliga Slott, the work palace of the Swedish king, for the changing of the guard. On our way to Stockholm's main shopping street Drottninggatan, we pass the parliament building, Riksdagshuset. The shopping street stands in stark contrast to the beautiful old city, it's seriously ugly. But the department store Åhléns is worth a visit, with its typically Swedish design houseware. Eventually we return to the old center. Norrmalm isn't much to write home about, especially the buildings are less interesting: most were built between 1940 and 1970. We arrive too late at the Moderna Museet on the island of Skeppsholmen, but its neighbor, the Arkitekturmuseet is still open: an impressive space with an overview of Swedish architecture, beautifully displayed on long white tables with large white desk lamps. In the evening we visit a kind of beach club next to our camping site. It's interesting to see how the Swedes feel about weather: even though it's chilly, they walk around with bare arms and legs. Probably because they have to wear sweaters for most of the year. Via Strandvägen (pretty avenue with extraordinary buildings), we walk to Kaknästornet next day, an ugly, 155 m high concrete television tower with a great view of Stockholm from the top. Our next stop is at the Vasamuseet. The Vasa was the largest, mightiest and prettiest adorned warship in the world. On her maiden voyage she sunk within minutes because she was overloaded. Now the ship can be admired in a gorgeous building which was - as it were - built around the ship. Those Swedes certainly know how to design exhibitions. There's a lot that we can't see now in Stockholm, a good reason to come back some time. Our neighbors on the camping site, for example, took a boat tour of the islands off the coast. Stockholm itself is built on 14 islands. Next day we visit Drottningholm, the king's residential palace. The gardens are green, but we miss flowers. The palace's interior is supposed to be impressive, but we don't have time, Dalarna is our destination for today. But we do visit Kina Slott: a Chinese pavillion. Bus loads of Chinese are clicking their cameras there. We take highway 70 to Mora on Lake Siljan. The surroundings of Lake Siljan look like the Sweden one knows from books: yellow rapeseed fields and red wooden houses. Pine and birch forests. It gets even better after the exit for Nusnäs. The landscape is so beautiful. This is where the Dalahäst lives, the wooden horse which is the symbol of Dalarna province. In Nusnäs are two horse workshops: Nils Olsson and Grannas. At Olsson the production is still according to traditional methods, but on a large scale. At Grannas the work is more subtle, the horses are painted with environment-friendly paints and the colors are brighter. Mora is a nice town with pretty buildings and artisan shops were people are busy embroidering, making bobbin lace and knitting. We also visit the Orsa Grönklitt bear park. Bears live in their natural habitat here. Which has a downside: one has to wait patiently until the animals show themselves. We only see brown bears, the lynxes and wolves stay hidden. To Hamar. We take highway 45 toward Malung and then via Värnar the 62 to Sysslebäck. Pine forests, later hilly landscapes, red houses and traffic signs with elks on them. Selma Lägerlof wrote her book about Nils Holgersson here. It's easy to imagine Nils sitting here somewhere. We meet a German who owns a restaurant here. He tells us that this is a popular skiing area, but he worries about the environment. Every year, Spring begins earlier and the ice melts faster. At S. Finnskoga, a wisp of a hamlet, we cross the border into Norway. Via Flisa and Elverum we drive to Hamar. From afar we see Vikingskipet. The Olympic skate rink is shaped like an upside- down Viking ship. Inside we see the stands and the dressing room for the skaters. The large parking lot has a kind of lookout. Via Lillehammer, where we see the Olympic ski piste from a distance, we drive to Ringebu. There we find a camping site on Lake Losna. In the dusk, we take a first look at the nearby stave church. It's the first one we see during this trip. It's a beauty with a red tower. The church smells of impregnated wood and shines in the evening sun. The church dates from 1220. The interior is painted in many colors and because of all the wood, the acoustics are special, too. It's a good thing that there is a description of all special characteristics for every stave church. It makes it easier to understand these extraordinary Norwegian constructions. Between 1100 and 1300 a thousand stave churches (stavkirker) were built in Norway, of which only 28 remain. They are wooden churches from the time when Christianity was just spreading in Scandinavia and they were built with vertical poles. We take the E6 and drive via Otta to Vågåmo. There we visit the stave church of Vågå. Next to the church is a special barn with a high, narrow shape. The third stave church we visit is in Lom. Coaches are parked in front of it. Not without reason, because it's an exceptionally beautiful one. The church dates from around 1240 and still has dragonheads on its roof, which means that it's one of the oldest. The dragons are supposed to scare away evil spirits. Especially the round part of the church is very pretty. Outside the surrounding brick wall one has the best view of the church. Unfortunately we have to skip Rondane Park and Jotunheimen: the weather is bad (rain showers) and te view is zero because of the clouds. We drive to Geirangerfjord. On the way we see our first elk, a female. The landscape changes quickly: large rock formations appear and there are no longer trees, everything is grand and vast. Geiranger fjord is of course best known, but at least as beautiful and impressive is the quiet plain on the Strynefjell, just before the road to the bottom. Twenty hairpin turns lead to the sheltered fjord valley. Between rain showers we pitch our tent on campingsite Vinje. In our rainwear we walk farther into the valley and take a look at the shore of the famous fjord and the village of Geiranger. Next morning we drive into the valley to catch the ferry to Hellesylt. Our guidebooks promise a lot of beauty, this fjord is on the UNESCO list for a reason. On the boat, a recorded voice tells us about the surroundings. Admittedly, it's a nice tour, but I don't think it's as overwhelming as the natural beauty we saw yesterday. Via Hellesynt we drive to Liabygda and from there to Valldal. Then we drive to Trolstigvei; it is a detour, but it's a must drive. The surroundings of Stigrøra are breathtaking. It's wild and the only thing that grows here is moss. The lookout Trollstigheim is gorgeous, as long as one ignores the tourist coaches and the many souvenir stalls. The Norwegians are brutal people: they still kill whales and here they sell antlers with some deer skin still attached. Behind a souvenir shop we see a guy "decapitate" antlers. It doesn't take long to descend the Trollstigvei, a wonderfull road, but the area before one reaches Trollentoppen is at least as impressive. Via Åndalsnes we drive to Ålesund and find a spot on camping site Prinsen. Because the camping site is on the coast, we have a great view of Ålesund there. Ålesund is mostly known for its unique architecture. In 1904 it almost completely burned down and was rebuilt in Art Nouveau style, at the time popular in Europe. Here its Norwegian version was invented. Moreover, Ålesund is one of the few cities in Norway built in stone. Lots of artisans here. On the way we visit a glassworks place. At Invit on the Apotekergt it's great to spend some time with hip Ålesund: it's a modern interior decoration store, where one also can have a great meal on their terrace on the water. After climbing 418 steps up Aksla hill, one is rewarded with a great view of the city and its surroundings. Later in afternoon we drive through an expensive toll tunnel to the islands of Giske, Valderøya and Godøya. The tunnels are steep and badly lit. Giske is and island with lush green pastures and colorful wooden houses. We take a look at the Giske kyrkje: a small white church built with marble and painted with white chalk to protect it from the sea air. The interior has colorful wood carvings. On Godøya, the next island, again lush green pastures. In the backyard of a colorful house sits a lighthouse: Høgstein fyr. It is round and very simple, but the surroundings are gorgeous. It's great to sit here and do nothing but enjoy the view for an hour or so. This time in the sunshine. We drive around Godøya and then to the island of Valderøya. We want to visit the Skjonghellaren cave. When we arrive, we find out that one has to crawl for 70 meters in a dark, damp cave before seeing the 25,000 years old drawings. We pass, because we don't have a flashlight with us and without it, it's pointless. Next day we drive via Ørsta and Volda to Austefjord. We could take a ferry, but this route is extremely pretty, along typical Norwegian landscapes with green pastures and deep fjords. In Lote we take the ferry, because the road to Skei is also worthwhile. Via nice roads, a lot of tunnels and the Jostedalsbreen glacier we drive to Borgund. On the way we pass the stave church of Kaupanger. This is the most basic kind of stave church. There happens to be a wedding and people in South-Norwegian traditional clothes just leave the church. We take the ferry to the Laer Valley. Near the stave church of Borgund is an information center about the history of stave churches. Borgund is particularly worth a visit, the church from 1180 is really wonderful. It's situated beautifully on a hillside, surrounded by greenery. This is the original version: no windows and benches on the inside. The outside gallery is remarkable. Driving to Bergen is a tunnel day. From Borgund through the Laer Valley to Voss. We drive through the Laer Valley tunnel, with its 24.5 km the longest street tunnel in the world. In comparison to the other tunnels it's sophisticated. There is enough light and there are three places where one can stop, which are very well illuminated. In the Undre valley we leave the highway to visit the smallest stave church of Norway. It sits in a secluded location. After some wandering and walking we see the mini church, 3.7 meters wide, dating from 1147. It is not immediately recognizable as a stave church and also the typical scent is missing: the church has been painted white. On the way we pass the exit to Flåm (spectacular railway) and Naerøyfjord, an extremely narrow fjord, also World Heritage). We have to make choices though and continue to Voss, Norway's prime ski resort. From a great distance we already see the ski runs. We have dinner at Indremisjonskafeen. All the old people of Voss come here to eat, it's a kind of church-run McDonald. Afterwards we visit the Vangskyrkja church. It's a Roman church, dating from around 1271. The interior is certainly worth a visit. The paintings are a story in and by themselves. The painter can't have been very skilled: the angels on the ceiling are a failure and the apostles on the choir are cross-eyed and not well- proportioned. The other paintings are wonderful and were made by a student of Rubens. We find a spot on the Lone camping site in Haukeland, at 20 km from Bergen. Beautiful surroundings and there is a frequent bus connection to the town center of Bergen. We take the Fløibanen (cog railway) to the top of Mount Fløyen at an altitude of 320 m, from where one has a view of Bergen as a real time map. We are prepared for a day with many tourists: there are huge crowds of old people and Germans in coaches. We have to wait everywhere and cameras flash all the time. The Mary church is closed, unfortunately. The Rosenkrantztårn is open though. Here we see how the city was destroyed in 1944 by the explosion of a Dutch ammunition ship in the harbor. From the tower one has a great view of the city. Håkonshal has a splendid dark-wooden roof construction. Both buildings have been rebuilt several times. Bryggen (the quay) is the face of Bergen, which is an old Hansestad (city which belonged to the late medieval Hanseatic League) for fish and grain. Because the buildings are made of wood, huge fires in 1702 and 1955 made it necessary to rebuild a large part of the city. Only a few original basements remain and one original house: Finnegård. Knowing this, Bryggen is still impressive, but it feels like a stage set. It's no more than a good reconstruction. The fishmarket (fleemarket) is a tourist trap, we have enough of it fairly soon. Via Utne we take the ferry to Kinsarvik (this can be done faster via Brimnes). Eidfjord is situated beautifully at the end of the Hardangerfjord and has its own fjord: the Eidfjorden. We have to pitch our tent in the rain. We are on a fishers camping site: everywhere we see fishing rods and we smell fresh fish. Our German neighbors give us four fat mackerels for dinner. It rains all night, but in the morning it's dry and we drive to Hardangervidda. From Dyranut we have to take an unpaved road to the starting point of the hiking trail which the tourist office has recommended: from Bjoreidalshytta via Stigstuv to Trondsbu and then back to Bjoreidalshytta. It's quiet, we only hear the water flowing and in the distance sheep's bells. Nature is wild here, large rocks with moss in yellow-green and black. Because it's almost Fall, there aren't many flowers. We also see few birds, reindeer or other animals. On the way we meet three Norwegians who have nets with them to catch fish for X-mas. They will be marinated in salt for a few months. Near Trondsbu is a shield that shows which animals live here: some kind of cavias, ermines, white fox, reindeer and several kinds of unusual birds. A Dutch guy proudly shows the pictures he took of animals. He took a different route (from Trondsbu). We only see sheep, but still it is an great walk in impressive and beautifully rugged nature. Unfortunately, we again have to put our tent in the trunk completely soaked, it has rained all night. We drive to Vøringfoss, the highest waterfall of Norway (184 m). There are several lookouts (the one at Hotel Fosslihotel is supposed to be the best), we take a look at the waterfall from the lookout half way and then drive to Oslo. We take highway 7 toward Geilo, a gorgeous route north of Hardangervidda. Beautiful and quiet landscapes with rocks and moss. Geilo is a ski resort. We have coffee at one of the restaurants that look like large ski huts and then continue on highway 40 to Kongsberg. In the Uv valley we find another stave church. It has a "stabbur" (stave barn) and one can have lunch here. It is situated in a beautiful location. The interior of the church is nicely decorated. Before entering the Uv valley, we pass by a fake stave church: it is the currently functioning church, which has more seats. The Nume valley could easily pass for Switzerland. Lovely geen pastures, wooden barns and mountains. For dessert, we visit the stave churches in Nore and Rollag. We end up in rush hour in Oslo. At 6:30 PM we arrive at the camping site Ekeberg, which has a fantastic view of the city. There is a lot of security at the entrance of the Munch Museum. In August 2004 two important paintings were stolen: the Scream and the Madonna. It's not a big museum but the art is wonderful. We take the subway to Vigelandsparken. Because the sun is shining, our first impression, with all those sculptures against a blue sky, is overwhelming. This park has only a fraction of Gustav Vigeland's work. All sculptures represent human figures, proportionally crude, but made thoughtfully. The monolith with surrounding figures is grand. The Oslo ski center Holmenkollen is worth a visit, with its Olympic ski jump and ski museum. It is a 25 minutes subway ride from the city center. The Olympic rings give the building, which looks already dated, a special look. In the Summer, the end of the ski jump is used as a swimmingpool. One has a great view from the tower; strangely enough, from here the depth of the piste doesn't seem all that much. The ski museum is not inspiring. Next we visit the Kunsthallen (Art Halls) which has a maze outside. The exhibition looks somewhat unprofessional. And we visit the famous shopping street Karl Johans gate. Many outdoor cafés and a lot of greenery. Next day it rains again. And the Norsk Folkemuseum is an open air museum... we run from house to house, to stay a little dry. There are buildings from all over Norway and there is an exhibition of traditional garb. The creativity of the decorations of the clothes is impressive. The highlight of the open air museum is a reconstruction of the stave church of Gol, the original of which dates from the 13th century. It is the ninth stave church we visit during this trip. The Vikingskiphuset is the most visited museum of Norway, especially when it rains. Because the museum isn't very large, it gets crowded quickly. The highlight of the museum sits right at the entrance: the Osebergskipet. This well-conserved Viking ship dates from 800. Grünerløkka is an interesting multicultural neighborhood with hip stores. It has a lively atmosphere. At the end of the day we visit Aker Brygge, Oslo's former wharf. There is a fair and an open-air concert. A good place to say goodbye to Norway. Next morning it rains so hard that we decide to go home one day early. But during three weeks in Norway and Sweden we only had three real rainy days, so we shouldn't complain. And it certainly won't keep us from coming back to these gorgeous countries, which are worth at least ten more vacations.